*Being Confident of This makes use of affiliate links. To find out more about affiliate links, please visit the About page. Additionally, a free copy of this book was provided for review purposes. However, all opinions are my own and I have not been compensated in any way for them. 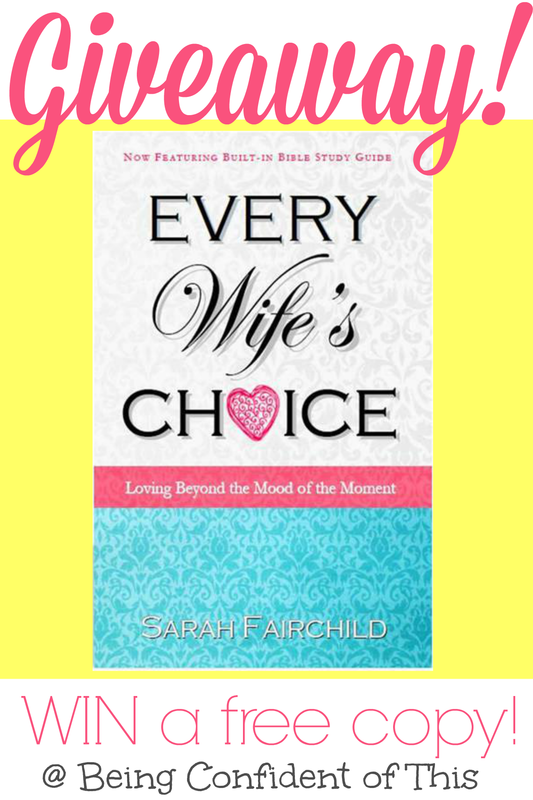 From the very first lines of Sarah Fairchild’s new release, Every Wife’s Choice, I knew this book had the potential to powerfully impact women, especially those in modern marriages. 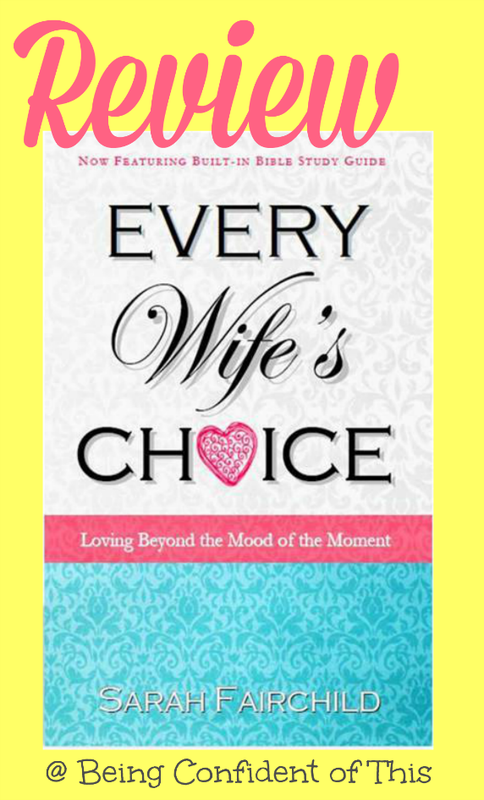 Every Wife’s Choice: Loving beyond the mood of the moment speaks to the current culture of do what feels good for you and the selfish human tendency to look out for our own interests. I’ll be honest; as a woman, even a Christian woman, my emotions often dictate my behavior if I allow them to. So stressful moments with my mate are compounded by the fact that emotions come into play and cloud my thinking. That’s why Fairchild’s book is so important for wives! “Sure, love is patient, but how do I choose patience in the midst of emotional turmoil? When frustration boils over into meltdown mode how do I release those pent up feelings and act patiently instead? Love is kind, but where do I draw the line before my heart begins to feel like a doormat? 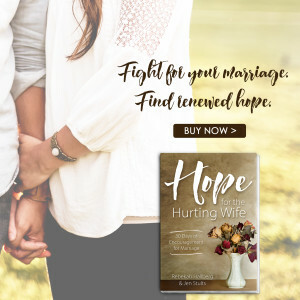 More than obvious cliche’s or trite sayings, Every Wife’s Choice delves into Greek word study to discover the significance of the First Corinthians love passage and apply that knowledge to everyday life in a practical yet biblical way. 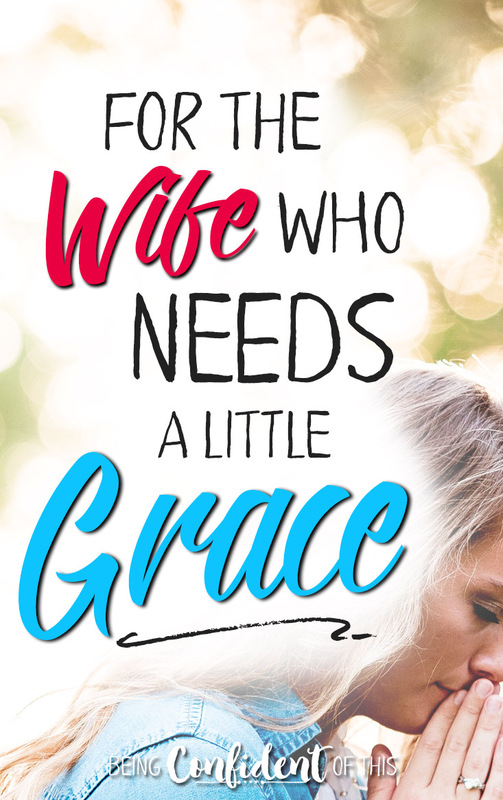 From chapter one, it’s clear to readers that the foundation for Every Wife’s Choice comes straight from the Gospel itself. The mercy and grace shown to us by a loving Father is what empowers us wives to choose to agape love despite what we are feeling in the moment! “Jesus never asks us to do more than He has already done, however, and He understands exactly what it means to love an enemy. That’s why I wholeheartedly recommend Every Wife’s Choice for women from every walk of life. 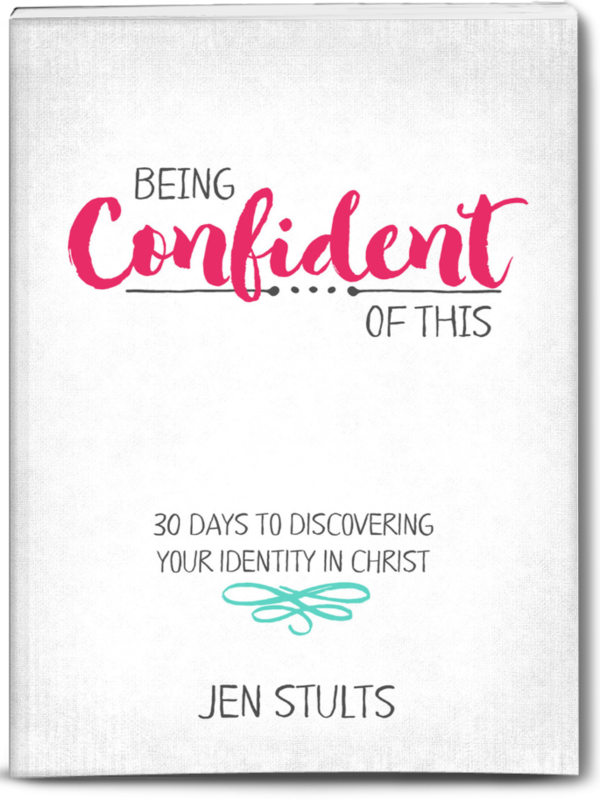 In fact, the application of the Greek word study contained in this book reaches beyond marriage, beyond women, and to all Christ-followers. It’s themes are universal! Although this study comes from a marriage perspective, the information contained is applicable to all women (and even men) desiring to love others as Christ loves us. It doesn’t hurt that Fairchild’s book is full of humorous anecdotes from her own life, either! The chapter titled “Till Dogs Do Us Part” had me giggling all the way through yet the humor did not distract from her important message. Fairchild’s easy style and quick humor remove any potential dryness that some readers might find in a typical Greek word study. And although the author’s approach is academic in nature, her effective use of story-telling sets readers at ease. 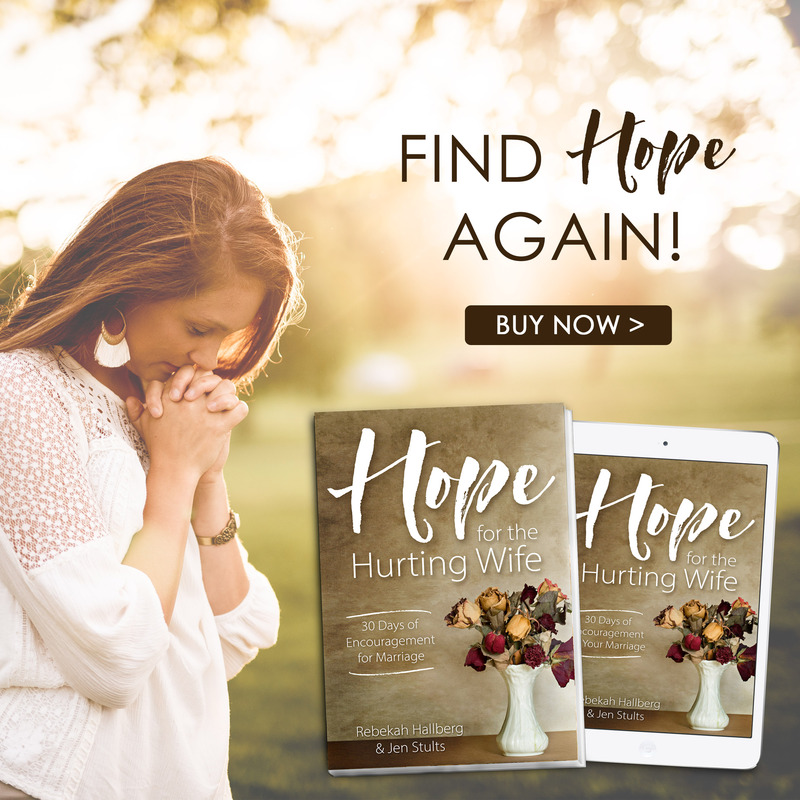 Fairchild’s aim throughout is to free wives from the tight grip of emotions so that we can become the wives God intended us to be, wives who reflect His heart for others. What better way to learn to be a godly wife than to study His Holy Word? You’ve read many a time here on Being Confident of This that we are work-in-progress women. Perhaps that is what I love most about Fairchild’s book – she recognizes the work-in-progress nature of married life. And she anchors the hope of progress firmly in our Lord. 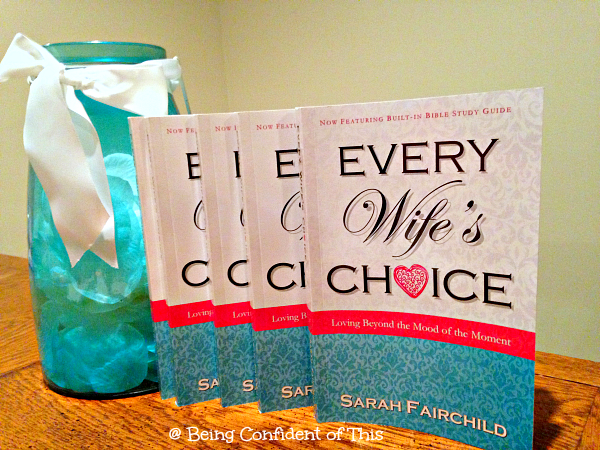 Enter to win a free copy of Every Wife’s Choice! Keep the up the good work-in-progress, friends! Last night I had a little run-in with Perfectionism again. He just won’t leave me alone. He follows me wherever I go, pointing out flaws in my house-keeping, my parenting, my marriage relationship, even my walk with the Lord. I’ve been enslaved by his words before, but last night was different. You see, my husband and I stayed up much too late because we were arguing about a financial issue. I felt angry and disappointed and fearful. 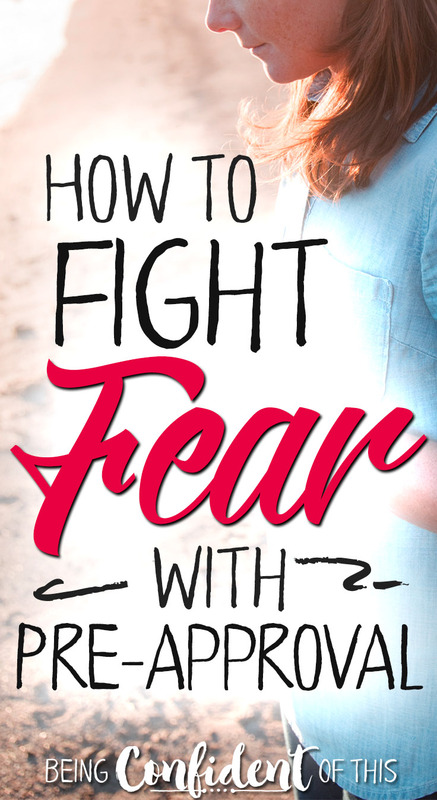 The familiar panic of how can I possibly do right in this situation and still get my point across welled up within me, and I knew a battle was swiftly approaching. I know some of you are chuckling right now, and rightfully so! It’s the quandary every woman who ever lived on the face of Earth deals with: to obey the Lord and demonstrate respect for my husband or to take control and make my voice heard? When it comes to submitting to and respecting my husband, I so often feel like Paul in Romans chapter 7. I know what I want to do, what I should do, yet I feel powerless to actually do it. I’ve believed so many lies for so long. But the Lord is faithful, and I’m learning to trust His promises to carry that work in me, in my marriage, until completion in the day of Christ (Phil. 1:6). Later on after our apologies were spoken and we both felt at peace, we finally turned out the lights in hopes for at least a few hours of sleep. Stunned, my disbelieving heart rejected his kind words and earlier tears returned in full force. “But I wasn’t patient!” I agonized. “I was so angry and so disappointed and I struggled, I really struggled, not to say mean and hateful things.” The weight of my own sin and failure hung about my neck. At that moment, the truth of his words broke through Perfectionism’s grasp. No, I didn’t handle the situation as well as I would have liked; I wasn’t perfect. Yes, there was definitely room for improvement. Nevertheless, his words rang true. What normally would have developed into a full-fledged, hours-long fight was briefly resolved. By the grace of God and the power of the Holy Spirit, I realized that we were definitely making progress. That’s when I saw Perfectionism for what he was – one part self, one part Satan. Self was prideful, Satan was deceitful, and the combination of the two brought me chains of defeat that I no longer wish to carry. In Perfectionism’s chains, I so often measure in black and white, success or failure, perfect or imperfect. Praise the Lord that my Redeemer is teaching me to put on my Grace-colored glasses and see the shades of success, to celebrate even the smallest steps of progress, to proclaim every small victory because of His work in me, in us. I hope I never forget that moment. My husband spoke freeing words to me last night, and the Holy Spirit confirmed them within me. Daughter, you are the good that you so desperately want to be, not because your efforts are so grand and your reach so high, but because you are walking a path of progress, trusting in the promise of redemption. I never asked you to be perfect, just willing. At the same time, daughter, you are perfect, not in yourself, but in my Son because He already carried these burdens with Him and nailed them to the cross. They died and were buried with Him. But you daughter, you rose with Him in perfection, a new creation, beautiful to behold, born of His glory. And now you no longer live as a slave in Romans 7, but in Romans 8 as more than a conqueror, confident in the promise that you will never be separated from His love! I don’t think I’ll ever cease to be overwhelmed by such truths, such promises, such magnificent grace. In the midst of my sorrow and my shame, my Savior showed up and handed me a pair of Grace-colored glasses. Perfectionism, you’re no longer welcome here. and the grace that has already set me free! Here’s the thing about “one word” for 2015: I’m just not sure how much I buy into it. It’s not that I doubt others when they claim to have received a word from the Lord to focus their year around, and I would never tell others to quit choosing a word, especially when they find it meaningful and purposeful. I’m just a skeptic in general. And to be honest, I’m not sure my word has changed all that much from what the Father was teaching me last year. So, I find myself struggling with whether to really embrace the idea or not. It feels a little forced to me, I suppose. Yesterday, when I read about the same ol’, same ol’ from Grace Covers Me, I felt so relieved! I’m not alone in my doubts or frustrations over the one-word frenzy. I’m not the only one lacking in the one-word department. I’m not a spiritual failure. Maybe that’s what it really comes down to: fear of failure. I’m afraid to choose a word – what if I get it wrong? What if it’s my will doing the leading in choosing it and not the Father’s? 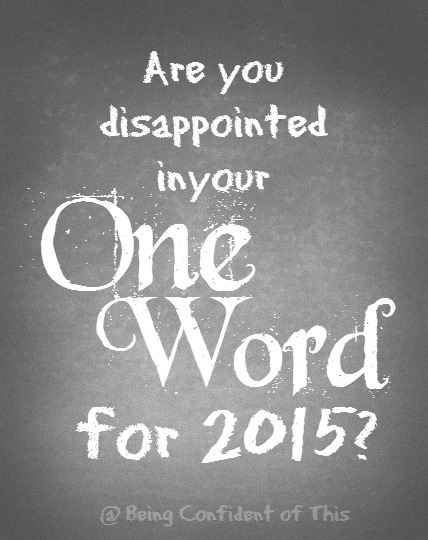 What if I don’t like my word for the year 2015? And you know, that’s exactly what happened. I’ve been praying, even begging, the Lord to give me insight. To open my eyes to His plans for this year. To provoke change this year. I’ve wasted too many moments worrying about this one word, as if the word itself held power over me rather than Christ Himself. Finally, I decided maybe I wasn’t supposed to have a word for this year. I quit looking for my one word everywhere, quit justifying the words I wanted to choose for myself. I decided I could skip the one-word link-up or just choose one of the verses that keep popping up for me instead and run with that. But then one morning we had this quiet heart conversation. I don’t really like that word, Lord. It sounds hard and possibly painful. And we’ve already done a year of trials and suffering. We’ve already been discouraged and overwhelmed. What about “Overcome?” That word sounds better to me. It’s joyful and final, and I know the ending of that word is good. That word means triumph, and isn’t that true, Father? We have victory in You! But your word is Persevere, Beloved. The triumph is coming, don’t doubt that. The victory is at hand, and is in fact, already yours. You’re like a child who sits willingly for a little while, learning the lesson, yet too quickly you hop up from this place. You think you understand, but you’ve only grazed the surface of the banquet of learning I have to offer you. Be patient. I know you’ve struggled long. Be patient; be still. Sit for the full lesson. Do not leave the table so eagerly, sure you have have found “the answer.” Sit. Wait. Stay (Ps. 27:14). But in your staying, don’t lose heart, Daughter, Beloved One. 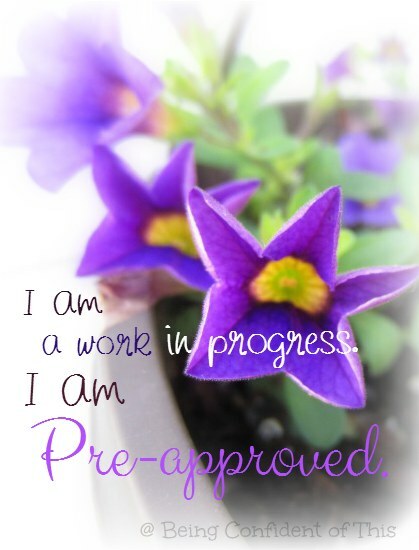 I promise growth, imperfect progress (Phil. 1:6). I promise blessing (Luke 1:45). I promise rescue and deliverance and victory (Ex. 14:14). You will overcome! You will prevail. I am the God of the impossible and the God who keeps His promises. Don’t run ahead; stay by my side and let me shelter you. Don’t lose faith now. Persevere. Oh, Father, I’m so weary and so frail. I’m so ready for the rescue. I want a different word, yet not my will but Yours. Help my unbelief. Help my trembling heart. Give me “chazaq,” courage to persevere even in this. When I am weak, then I am strong. Don’t let me forget it! I will never let go, Daughter. I will never leave you or forsake you. You are not in this alone, for I walk by your side, even more I carry you. That’s the deliverance you receive now. I carry you. I am with you. I don’t ask you to persevere alone and by your own strength, but by my Might (Josh. 1:9). Ok , Father. Ok. I see now, although not yet fully. I see there is power in persevering. I see the hopeful waiting, the strong assurance that You will not leave us here to waste away. I see the strength in that stance. I feel the joy in it! I hear you calling me to stand, yet not to run. No, not yet. But soon. I will follow You and wait on You. You are the Lord God, the lover of my soul. You make all things new in Your time. So, I will wait and only by your grace, I will persevere. I’m certain this conversation will keep playing out for me, stubborn, sinful thing that I am. 🙂 I still have a few lingering doubts about “one word” but I find value in this process, for it required much abiding in Him. And that’s never a bad thing. My friends, if you find yourselves lost in the one-word frenzy, don’t despair. You are not alone. Even more, if you’ve heard His voice, yet find disappointment in what He has to say, take heart. He will carry you through. So there it is – the same ol’, same ol’. I can’t say for certain that this word will be mine all year long, but I do believe it’s mine for now. Same ol’ truth; new perspective.